Courtenay, BC, Feb.20, 2014: Canada just gained another gold! 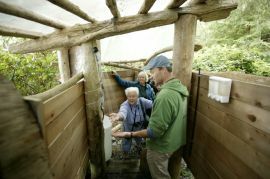 West Coast Expeditions (WCE), a Vancouver Island based company, has earned the respected Green Tourism Gold Award through the internationally-recognized Green Tourism certification program. 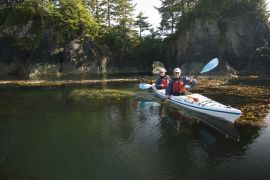 West Coast Expeditions is the first sea kayak tour company in Canada to attain this gold standard, and one of only 14 Green Tourism Gold businesses nationwide. This was achieved through voluntary participation in a rigorous third-party assessment that considered over 145 evaluation criteria across 11 review categories; 60 of these criteria were selected by the assessor and graded as most relevant for West Coast Expeditions. After further review by a senior assessor from the UK, WCE received notice of their Gold Award! West Coast Expeditions' owners and staff have long adhered to purchasing values, partnerships, and practices that are conscious of impacts. 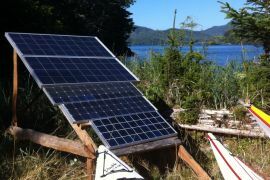 Their seasonal wilderness sea kayaking retreat in the remote Kyuquot area features a solar power system for their minimal power needs, rainwater collection systems and water conservation measures, and a long history of reciprocal cultural interactions with the nearby Aboriginal community. Their year-round office in Courtenay has implemented multiple energy efficiency upgrades. In 2013, WCE also partnered with Ambassador Shuttle from the Comox Valley to transport guests to their remote location on the Northwest part of Vancouver Island, reducing the overall consumption of fossil fuels associated with their tours. Pinel and former WCE owner, Comox Valley professional biologist Rupert Wong, have also shared a 20 year history as Volunteer Wardens for the Checleset Bay Ecological Reserve which is the largest in the province and adjacent to their base camp site on Spring Island in Kyuquot Sound. Pinel currently contributes as a volunteer Board Member with the Wilderness Tourism Association of BC, and WCE further supports this and other non-profit environmental organizations as a Business Member with 1% for the Planet. 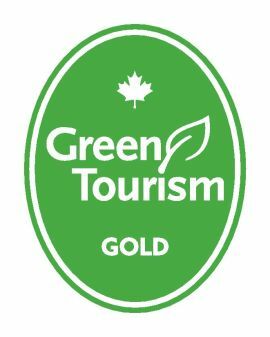 With this Green Tourism Gold, West Coast Expeditions joins over 2,200 other tourism companies recognized for responsible and sustainable tourism practices in the UK, Ireland and Canada - the largest and most established sustainable tourism grading program in the world. Consistent with WCE’s history, Green Tourism assessments take into account the needs of the environment, local residents, businesses, and visitors; now and in the future. By sharing their good news about this award, West Coast Expeditions hopes to encourage and inspire other tourism businesses to similarly pursue an assessment of their own Green Tourism practices. WCE is the first business from the Comox Valley to be assessed, the eighth on Vancouver Island, and the 40th in Canada. West Coast Expeditions (WCE) is the passionate pursuit and cumulative effort of marine educators who've fallen in love with the remote Kyuquot area and people on Northwestern Vancouver Island, BC. Our tours start and finish in the Comox Valley (Courtenay/Comox), which is also our year-round office location. We've been industry leaders in connecting people from around the world with the local community, Aboriginal culture, and west coast ecology since 1972, and specialists in sea kayaking experiences since 1988. Our scheduled and customized tour packages are between 4 and 9 days long and are offered from June to September each year. We invest significant thought, effort, and expense minimizing our ecological and carbon footprint, while offering social, economic, and environmental benefits. WCE have active professional affiliations with the Sea Kayak Guides Alliance of BC, Aboriginal Tourism BC, and the Wilderness Tourism Association of BC. We support a number of non-profit community, active-living, and conservation initiatives through volunteerism, donations, and sponsorship, many of which are tracked through our commitment as a member business with 1% for the Planet.